Sharp's pair of big-screen, super high-resolution beauties are preparing for a world beyond the limits of 4K Ultra HD. Over here in the UK Sharp is the name which once adorned Manchester United's shirts and now sits on some pretty entry-level supermarket TVs. 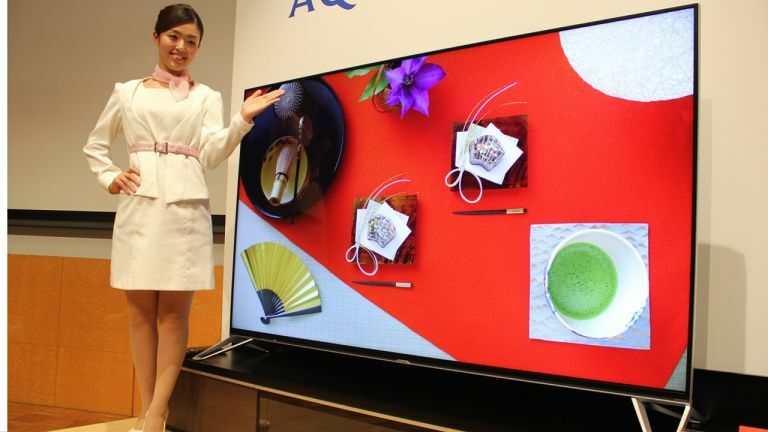 In Japan though Sharp is the biggest homebrand TV manufacturer around - outselling Panasonic and Sony by huge margins. So that's why, in the country where 4K Ultra HD is going big first, we're now seeing the first 8K TVs going on sale. At the top of the tree is the recently announced Sharp LV-85001, a native 8K television with a crazy-high resolution of 7,680 x 4,320. Yup, that's four times 4K. It's not just the resolution that's eye-watering, the price is too. The Sharp set is only being sold in Japan right now, where it costs 16 million Yen. Converting that in a strictly linear scale puts it at some £86,000. Or the price of a three bedroom mid-terrace house in Neath. Our friends over at techradar.com though have just got hands-on with a far more affordable (relatively speaking, of course) Sharp TV also claiming some 8K capabilities. The Sharp Aquos LC-80UX30 is another Japan-only TV sporting 8K upscaling processing. It takes a 4K video input and upscales it to a vast 33 megapixel output. It's on sale in Japan for around 1.7 million Yen, that makes it a far more reasonable £9,000 with a straight conversion. The Sharp 8K upscaler though is only a short-term step towards full 8K televisions, after all, the Japanese manufacturers have got their work cut out to get a decent range of compatible screens out in the market for 2020 - when the Tokyo Olympics begin broadcasting in 8K. But what about the best 4K TVs you can buy today? Here's our pick.